Google has introduced an interesting new feature to the Google Play Store after it began allowing users to pre-register for upcoming Android apps. 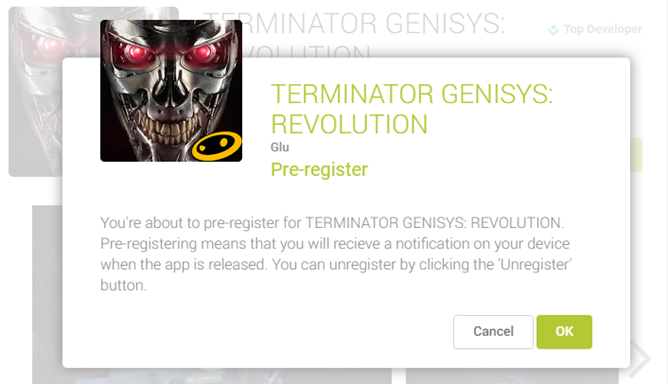 Terminator Genisys: Revolution from Glu Mobile — the company that recently took investment from China’s Tencent — is the first title to take advantage of the feature, as the folks at Android Police noticed. Interested users simply tap the pre-register icon (which is where ‘download’ would usually be) to show their interest. Pre-registration is free for Android customers, and there’s no obligation to download or buy the app once it is live. The process sets up an alert that prompts a user once the app is available. It is not a lock-in, since users can cancel their interest if they have a change of heart. Pre-registration isn’t for your average developer, but it could be useful for games that are timed for release alongside films — i.e. Terminator — or sequels or big budget productions that want to drive up interest and hype pre-launch. This is another example of differentiation between Apple’s App Store and Google Play. Google has long allowed a number of unique features, including allowing developers to respond to reviews. That said, the company is known to be more lax when it comes to vetting new apps and updates — that’s thought to be one reason why the risk of malware is higher for Android customers.